S-1110HP-SC05U - 10/100/1000 Gigabit Ethernet Media and Rate Converter with Type 4 High-Power PoE PSE (up to 100W/port): 10/100/1000BASE-T (RJ45) [100 m/328 ft] to 1000Base-BX 1310nm TX / 1550nm RX single strand fiber, multimode (SC) [550 m/1804 ft]. Includes AC Power Adapter. An advanced Ethernet to Fiber Media Converter solution to transparently connect copper to fiber. 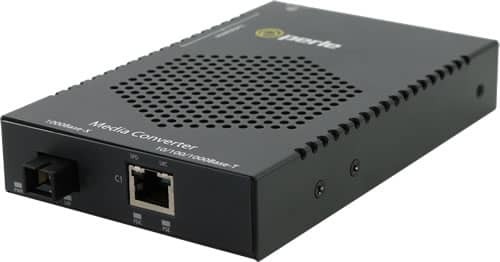 Fully compliant to IEEE 802.3bt, Perle Hi-PoE Media Converters are classified as Power Sourcing Equipment (PSE) to provide up to 100 watts of power to PoE compliant devices such as IP cameras, VoIP phones and wireless access points. For complete product details and technical specifications, please visit our S-1110HP Media Converter Product Page.